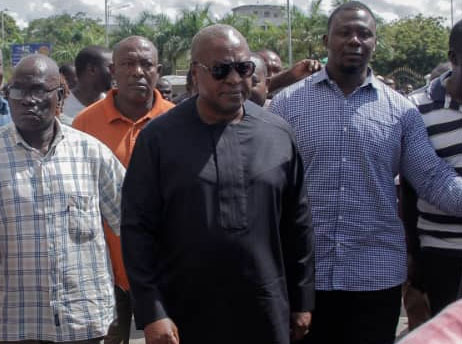 Former President John Dramani Mahama showed up at an Accra High Court where the National Chairman of the Opposition National Democratic Congress (NDC), Samuel Ofosu-Ampofo appeared over his alleged leaked kidnapping and assassination tapes. The former President and other party heavy weights were at the court very early in the morning, even before the gate to the court was opened. Joining him in court were the general secretary of the NDC, Johnson Asiedu Nketia, Ato Dadzie, Kakra Esummah, Joyce Bawa Mogtari and other party officials. The court room was filled to capacity as party supporters and sympathizers thronged the place, DGN Online’s Gibril Abdul Razak reported. There was also heavy security presence in and around the court premises. This happened before the court, presided over by Justice Asiedu, was yet to begin sitting. Deputy Communications officer of the NDC, Kwaku Boahen, was also in court. They were there to among other things to answer questions on the charges leveled against them as a result of the explosive tapes. Mr. Ofosu Ampofo, it would be recalled, was caught on tapes earlier this year purportedly calling for the assassination and kidnapping of some Ghanaians as well as waging a “ruthless” war against the Chairperson of the Electoral Commission, Jean Mensa. He was subsequently charged together with Mr. Boahen by the Criminal Investigation Department of the Ghana Police Service. The charges slapped on them are conspiracy to cause harm and assault against a public officer. They have however denied the claims against them.